Is pork a national security asset? China's major meat producer Shuanghui International plans a $5 billion buyout of U.S. meat processor Smithfield Foods -- a deal raising concerns and calls for government scrutiny. Is America's pig supply a critical national security asset? That's a question being raised by the planned $5 billion acquisition of Smithfield Foods (SFD) by China's Shuanghui International. 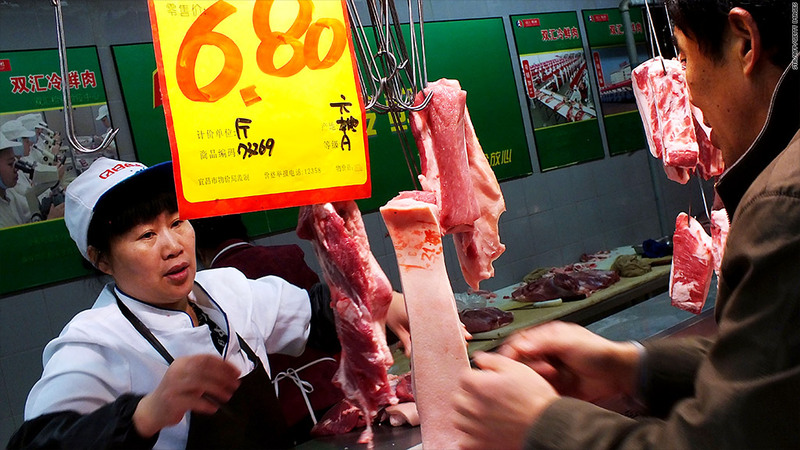 The deal would pair Shuanghui, one of China's major meat producers, with Smithfield, the world's biggest processor of pork. It would be the largest acquisition ever of a U.S. company by a Chinese one. As is common with many high-profile mergers between Chinese and American companies, the proposal has drawn political fire. "To have a Chinese food company controlling a major U.S. meat supplier is a bit concerning," Sen. Charles Grassley, R.-Iowa, said in a statement shortly after the deal was announced by the companies on Wednesday. Grassley is urging the federal government to scrutinize the deal, including any involvement that the Chinese government may have in Shuanghui. Indeed, the acquisition will have to go through several layers of review in Washington. Among the officials taking a look will be the Committee for Foreign Investment in the United States. Review by the committee, known by the acronym CFIUS, typically has a very narrow focus. Its job is to assess the potential national security effects when a foreign entity seeks to gain control of a U.S. company. Companies involved in such deals can voluntarily have CFIUS review the transaction, as is the case with the Shuanghui-Smithfield deal. However, the committee can also mandate a review if it believes a deal may raise national security concerns. The initial review takes 30 days, and up to 45 days if more information is needed. If the committee determines there are national security concerns that cannot be resolved, it can recommend a presidential review. Only the president has the authority to suspend or prohibit a transaction. Experts said the vast majority of deals that involve foreign direct investment generally don't require such a government review. Two deals have been blocked by a president on national security grounds. The most recent was in 2012, when President Obama nixed the acquisition of four wind-farm companies by a Chinese-owned firm. The concern was that the wind-farm projects were located near a Navy weapons facility in Oregon. Experts said it makes sense that the parties in the Shuanghui and Smithfield deal are seeking CFIUS review. "This is a significant deal involving a Chinese company," said David Fagan, a partner at law firm Covington & Burling in Washington, D.C. "It can cause political scrutiny." Fagan said it's "prudent" for such transactions to go before the committee "even if the deal is not expected to surface national security concerns." Two potential issues that could draw a close look at the Shuanghui-Smithfield deal: Smithfield has some contracts to supply meat products to commissaries on or near U.S. military bases, and its Virginia headquarters are near a large U.S. naval complex, according to a source familiar with the matter. Another worry: Grassley's claim that "unsafe tactics used by some Chinese food companies" raise concern about the future safety of the U.S. food supply if the deal is approved. The U.S. Department of Agriculture, which regulates Smithfield, "will continue to regulate Smithfield's products regardless of a change in ownership," an agency spokesperson said. The president of a group representing American operations of global companies said criticism of the deal was "outdated." "The food supply is part of our critical infrastructure. But that should always be protected regardless of a company's ownership," said Nancy McLernon, president of the Organization for International Investment. "It's imperative that we don't slam the door on job-creating investment by foreign companies based on knee-jerk reactions."